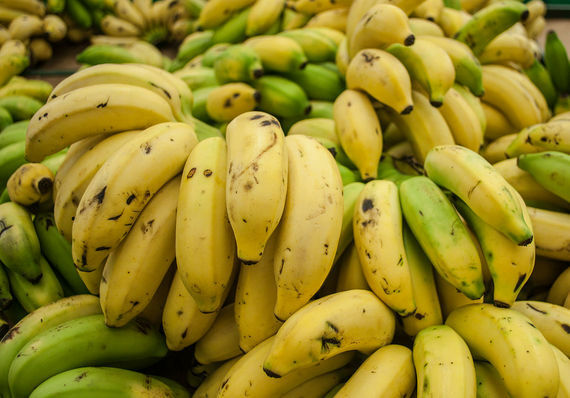 Major media outlets, including CNN, The Washington Post, and the Daily Mail, have had headlines proclaiming the impending demise of the Cavendish, the world's most popular banana, using words like "extinction," "doomed," and "death." But look a bit closer and you'll notice these same headlines also contain words like "possible," "could," and "may," which indicates something far less frightening. In science-speak, Tropical Race 4 (TR4) is a strain of the fungal plant pathogen Fusarium oxysporum f.sp. cubense (Foc) that causes Fusarium wilt, commonly referred to as Panama Disease. In plain-speak, this fungus can wipe out entire banana plantations since it's immune to chemical pesticides and can stay in the soil for years. The disease attacks the banana plant's root system, moves into the vascular tissue causing wilting, and eventually kills the plant. It's spread through infected planting material, dirt, and water. The Cavendish (which is what we find in grocery stores here, and includes the commercially important Grand Nain and Dwarf Cavendish cultivars, among others) is highly susceptible to Foc TR4, but the disease can also travel to other banana varieties, which is a huge issue, especially in poorer countries where bananas are a staple food. Foc TR4 has been negatively impacting Cavendish banana production in Taiwan, southeast Asia, China, and Australia's Northern Territory for more than 20 years. (In Taiwan's case, it's been more than 40 years.) In Indonesia, for example, where commercial Cavendish production started in the 1990s, more than 8 million plants were destroyed annually by the disease within two years of establishing the industry. Many plantations had to be abandoned, and annual losses totaled more than $75 million. Beginning around 2013, there were reported outbreaks in Mozambique, Jordan, Lebanon, and Pakistan, according to Fazil Dusunceli, an agricultural officer with the Food and Agriculture Organization of the United Nations (FAO). Foc TR4 also made further inroads into Australia from the country's Northern Territory into Queensland, but according to a report from the FAO, it hasn't yet reached Latin America (South and Central America, the Caribbean, and Mexico), which at 80 percent of the world's production, is by far the largest Cavendish banana-exporting region. A November 2015 paper written by researchers from Wageningen University in the Netherlands and published in the journal PLOS Pathogens, confirmed that the outbreaks of Panama disease in Asia, Africa, Australia, and elsewhere were all caused by Foc TR4. Shortly after, the international press ran with the story, with many predicting the inevitable spread of the disease to Latin America and that the end of the Cavendish banana was nigh. "Cavendish is now collapsing and there is nothing to replace it," Dr. Gert Kema, from Wageningen University told the Daily Mail earlier this month. A story in The Washington Post titled "Bye, bye, bananas" stated that researchers believed Foc TR4 would "eventually make its way to Latin America" and that "it's not a question of whether Tropical Race 4 will infiltrate the mothership of global banana production; it's a matter of when." But one banana researcher calls this media hype. "The western press is so enamored with the 'Bananageddon, Apocalypse' scenarios because it sells, both for the media as well as the researchers who are looking for money for their GMO research," Dr. Agustin B. Molina, Jr., tells Modern Farmer in an email. Molina, who lives in the Philippines, is a researcher for Bioversity International, a global research-for-development organization focused on sustainable food and nutrition security. He was in Miami this past week as part of the International Banana Congress where he read a paper on Foc TR4-resistant non-GMO Cavendish varieties. The paper isn't available online, but he makes similar points in this post. According to Molina, the predictions of the invasion of Foc TR4 to South and Central America are so open-ended as to be meaningless, since they could refer to "next year, the next ten years, 20 years, 50 years, or even the next century," he says. 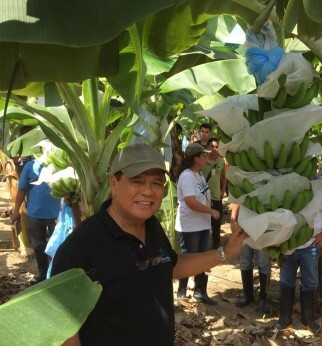 Molina, whose credentials include a PhD in plant pathology from Pennsylvania State University, has more than 40 years experience in the banana industry, in both the academic and private sector, and focuses his research on integrated disease management including Fusarium wilt. He believes Latin America lies in a "strategic geographic location" due to its distance from the other affected areas of the world, which can help in preventing Foc TR4 from making inroads there. He points out it's been more than 40 years since Foc TR4 first appeared in Taiwan, and it still hasn't reached the Americas. Dusunceli from the FAO says Foc TR4 could "in theory" continue to spread across the globe but only if producers aren't vigilant. They have to use disease-free certified planting materials, and not allow any materials or soil that could possibly be infested onto their farms, he says. "The FAO collaborates with many research institutions and scientists on many aspects to promote the best practices to prevent the spread of the disease," Dusunceli says. "The focus in these efforts include promotion of international collaboration, coordination among national institutions, awareness-raising among producers, capacity building, and implementation of phytosanitary measures." We can look to the previous major outbreak of Panama Disease to see just how slowly the disease can spread. The earlier pandemic--which shook the banana industry to its core and led to the commercial demise of the Gros Michel banana, the primary variety grown for worldwide export that the Cavendish replaced--began in the late 1800s but didn't completely wipe out the Gros Michel's commercial viability until the early 1960s. In regard to the newest global threat, Molina believes that new technologies that weren't available back during the last pandemic, such as the use of tissue culture, could help the Cavendish banana industry survive. Regardless if Molina's optimism proves true, scientists at institutions and research organizations around the world are developing resistant Cavendish cultivars through various methods, including genetic modification. Kema, the researcher from Wageningen University, tells Modern Farmer in an email that resistant germplasm (the living tissue from which new plants can be grown) is urgently required, using any potential methods--including genetic modification. He and his team, he says, are hard at work finding a suitable replacement. Foc TR4-resistant GMO Cavendish bananas are currently being field-tested in Australia, but Molina argues there's no need for them since there are already TR4-resistant Cavendish varieties created through tissue cultures. Foc TR4-resistant Giant Cavendish Tissue Culture Variants (GCTCVs) are becoming practical options in managing epidemics of the disease in commercial plantations, he says. Two of these, GCTCV 218 and GCTCV 219, were selected by the Taiwan Banana Research Institute from millions of tissue-culture-derived seedlings, and while not completely immune from the disease, these varieties have very low levels of infection. Molina believes these are the best options for growers. Kema isn't sold, however. "I strongly disagree with Dr. Molina's so-called solutions. The message is very disturbing as the clones he mentions are not resistant; they're at most less susceptible and hence only postpone the problem, but don't tackle it fundamentally," he says. "Moreover, farmers will go back to business as usual, which will only increase the dissemination of TR4. I do not know of any other crops where current problems are approached in this way other than the banana industry. This requires science, not stories." Molina notes that the commercial banana industry is being hit hardest by Foc TR4 because of the the industry's reliance on monoculture--commercial Cavendish bananas that make up 99 percent of the $13 billion worldwide export business are genetically identical. The fungus doesn't cause "severe and devastating epidemics" for small-scale farmers who are growing a variety of non-Cavendish bananas for their local markets. Molina says the use of genetic diversity in their bananas makes these farmers and their cropping system "resilient and sustainable." Kema, though, says because the Cavendish is so susceptible, it's a vehicle for spreading the disease to other banana varieties, and that unlike the commercial banana industry, small farmers can't just pull up stakes and leave if Foc TR4 strikes their crop. He says despite bioversity's presence in Asia, Foc TR4 has continued to spread all over Southeast Asia and to other continents. "This problem requires a broad approach, and the damage by this type of message completely disregards these side effects that hit potentially many more farmers that rely on the banana," he says.